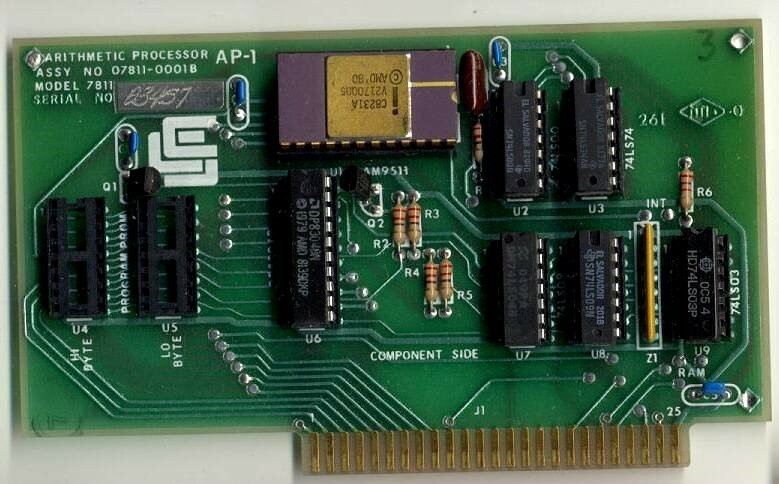 Does anyone here know anything about this board: Arithmetic Processor AP-1. It's an oldie. I've had this for quite a while now and have virtually no information or software on it. The photo here was taken off the web in my search but I have virtually the same board with a different S/N. has this, I'm happy to share the collection (though limited) of what I've found so far. But there is no reference as to where or how to get the ROMS in the manual. They only specify that they are 256 by 8 bytes. (not very big!) Likely an MMI 6300 series fuse link PROM. There is also reference to putting RAM in those sockets as well, but for unknown reasons not described in the manual. (The manual is somewhat vague regarding ROM or RAM useage) But the software is most important for running the card, and they address it as being Integer and AppleSoft compatible. Reverse engineering the card will be a significant hassle, as the designer/builder made this card to perform scientific calculations by setting an interrupt at a specified location and jumping to a routine (located on that CCSoft Disk) that executes the calculation(s) and returns the value & status back to the Apple II for display or whatever. I don't think I would be able to make this card work without that disk. At least, not very well. So I hope that you are able to adopt this to get the Apple card running. Maybe you could upload an image of the backside of your card, so we might be able to re-engineer ? If you could share a BOM that would be great as well. :Update: maybe you can take off all ICs and take a new picture of the Top layer, too? This might help to see the pcb tracks and to reengineer the card to create a schematic. Maybe late today (if I'm lucky) I will desolder all the parts on the board and take a snapshot of the front and back of the card. glad to share you the information's, while I don't believe that you need to desolder all ICs, just removing them from their sockets might be enough... to see the trace routing. so command 6C, as used above at the shared code, is mentioned at page 1-7, so I do believe that you should be able to address the card via BASIC as we did with our ZX Spectrum computers. To understand how this works, please use the shared PDFs. And I do found a company using the same name as referenced in the manual, so maybe it's worth to contact them. as I thought myself... CCS did something similar as some folks of our Sinclair community did... patching the ZX Spectrum / ZX81 ROM. CCS "patched" Applesoft to use the APU instead of the 65(C)02 when using some specific mathematical instructions which are supported by the APU. "Apple APU. The Model 7811 B Arithmetic Processor Unit is intended to increase the execution speed of Applesoft II programs and the number of math functions available. The system employs an AMD9511 APU and plugs into one of the Apple expansion slots. The CCSoft interpreter is loaded from the diskette provided, and the system is ready to, go. The CCSoft interpreter is identical to Applesoft, except that CCSoft sends arithmetic functions to the APU for fast execution. Additional functions include AsiN(x), ACOS(X), LOGIO(X), SINIH(x), COSH(x), TANH(X), INVERSE(x) and PI. " So you need someone (or yourself) who's able to implement such patches into Applesoft. Wow! Really good information! Very much appreciated! You spent a bit of time on this. Thank you again! While you were finding all this, I decided to go ahead and desolder the board and photograph it to share with you and others. While the IC's are all marked on the componernt side of the PCB, the resistor & cap values are not, so I will divulge them here so everyone knows. All discreet resistors are 220 ohms except R6, which is a 2.7K ohm. All capacitors are 0.1uf decoupling, except C4, which is a 270pf silver mica type. Q1 & Q2 are FPN2907, and the 8-lead resistor pack is 2.7k. Pretty much covers it. Photos: Larger versions are available upon request. that's great... many thanks for that. In between I found the schematic of the board which is attached to the Documentation. So yesterday I started to redraw the schematic using KiCAD. Your pictures are more than welcome as this will help to place the traces as done by CSS. It will take some time to have this finished. There's also one IC which is an Octal Transmitter/Receiver and which seems to be very rare... so maybe another one needs to be used here. All other components should be available... while for the Transistors a BC556 should be used instead of the one used by CCS. I also found additional information about the company... if these are right they seemed to start with S100 Bus System components. Will share the link when I'm at my desktop computer. Tokabln, looking at the schematic and comparing it to the actual board, you're going to see many differences, so you might want to re-draw the schematic from the board. (just saying...) I found a lot of differences when I drew the schematic from a WildCard board. Other boards as well. I will eventually re-draw this one but I want to finish up a previous project first. Beside the first version using ABACOM SPRINT using the uploaded PCB pictures as template. Hope I didn't mist any trace. Schematic needs to be redrawn using KiCAD..
Are you planning to produce some boards? If yes, what about a more "modern" version with replacement of the DP8304 to 74LS245 or similiar and a RAM chip which is available now? I can't believe how fast you put that together. I just did a visual trace and it looks like you've got everything there. If I were to suggest anything at all, I would set the RAM jumper and INT jumper to accept a 2.54mm (0.1) spacing molex pins rather than a solder bridge. That way, you can use those convenient molex jumpers. well I'm actually not sure if I'm willing to setup a batch of boards. First task was, to preserve what was done in the past by CCS. Next step might be to change the DP... to a more modern Transceiver/Receiver stuff. I'm also not sure yet how to address this card, as only Addressline A0 is used here to toggle between the Command-/Dataregister. But that's it, so it's very different to what we did with the ZX Spectrum. Here we used a fixed address to load/unload the mathematical stuff, toggling between Data- and Command Register as shown above within the shared Basic code. So I believe we need to understand the philosophie behind what was done for the Apple, which I haven't done yet... because I'm not very familiar with the Apple Bus. @macnoyd... yes you are right, INT / RAM should be using a small Jumper instead of a wired brigde. I will change this and will made the GERBER files available. It doesn't make any sense to produce boards and to ship them to worldwide afterwards as the costs are to high than. So if someone like to (re-)build the original card, he can do that and maybe have some spare for folks within his country. If someone is interested please send me a PM with your eMail Adress and I will share the file, because I can't upload athe ZIP here. Those who are interested in, please double check the included board pictures with the original pcb pictures shared by macnoyd, just to prevent mistakes. Even that macnoyd has done a precheck, it's not my fault if you are getting wrong pcbs. @macnoyd: I will send it to you in a few minutes using your shared eMail address. First task was, to preserve what was done in the past by CCS. I'm also not sure yet how to address this card, as only Addressline A0 is used here to toggle between the Command-/Dataregister. But that's it, so it's very different to what we did with the ZX Spectrum. The /DEVSEL line addresses the FPU. /IOSEL addresses the SRAMs. Means in slot 1 the addresses of the FPU are $C09n. SRAM: there are two SRAMs 256*4 in two 16pin sockets. I can only find one chip that fits: Intel 2112. Very rare? thanks for the explanation... so that make sense... because CCS talks about using additional RAM or additional ROM within the manual. So maybe I can change the RAM part from 2 x 2112 to another 256 Byte RAM type. Let's see. and $C091 when A0 is high? As a DP8304B Octal Bus driver replacement a 74LS244 (not pin compatible) seems to be okay to do that job. Thanks again and maybe we can discuss offline (in German) how to enhance the card. I will send you my eMail Address via PM. Also want to note that the buss driver IC is readily available, so not worth changing unless you do a board re-design. The 2112 sram are rare. I was going to check the datasheet of MMI 6301 and see if the pinout is compatible. [EDIT] The MMI-6301 (256x4) seems to be compatible right down to CE, so I believe a pair of these would be required for resident Apple ][ code. I've gotta guess these would be "fun" to program, LS nibble in one & MS nibble in the other. That and these are fuse link PROMS, no room for error. But they were (at the time) what was available at reasomable cost. EPROMS were much more expensive in the late '70's. After reading (and understanding?) the manual I think having this RAM is not necessary. It's a nice feature to have 256 bytes of RAM (or ROM) for 6502 code, but now in 2019 it's expensive to get these obsolete chips. Means: no need to populate Q1, R4, R5 and the jumper for RAM. yes you are right. I will put this hint onto the schematics including that 2112 RAMs are used at position U4 / U5. Yes, got it. Thanks for keeping me in copy. I hope he responds and has something for us. That would be great if he does. Regarding the ROM / RAM sockets, I think it would be relatively easy to change this to a single 2K x 8 socket instead of the (2) 256 byte by 4 configuration that currently exists. At the time, the 2112 and 6301 were good choices, though today, maybe not so much. Fortunately, there's a 2K x 8 RAM & EPRom that closely matches, pin for pin. For me though, there's something nostalgic in keeping the design like it is. Not all would share this opion, but that's OK. I can draw up a schematic using 2716 EPROM or 6116 SRAM layout if it's a consideration, but I'd like to do it only after we obtain the CCSoft disk. Without that disk, we would need to re-engineer the software, and I'm not in a good place to do that right now. Too many other projects in the works. The CCSoft disk is what makes this board desirable, in my honest opinion. I'm hopeful that this disk exists somewhere and is discovered. So when I'm done with the CCS original schematic (while I will take care to use the card as reference), I probably will start to do a redesign (probably with Ralf) and will share and discuss with you folks if something else is needed or requested. Please keep us posted when something new comes about. Great work! Write your own 9511 software ? Have fun... while I'm still seeking to get more updates... so stay tuned. Just to let you know... the cards seems to be shipped be the manufacturer seeed... so I will keep you posted when the raw pcbs arrived. I too ordered 10 pcs. of the DP8304B for the German community while I will take at least 2 pcs., but not sure when they will arrive. I will add an order for one aw old card too. the raw pcbs arrived today. So I need to build at least one card to see if they will work. Beside two pictures of the card. Looks pretty authentic. Well done! That board looks great! I hope it works as good as it looks! beside the populated CCS 7811 Clone card (except the RAM/PROM chips). Next step will be to do some testing and to document the building and some technical stuff. I do have a couple of raw boards available and a few spare parts to serve the above requests. I'm not able to sell the APU (Intel C8231A) as I do not have them available anymore. I can also share the transistors (if the testing will work), the R-pack and probably some TTL which are not typically available and only a small batch of the DP8304 gate. I will setup a list of what's available and what's not in a few days. the card is working... beside two test programs I used. This means I can offer the card and some (not all) parts to a couple of folks, while I will start with the above list. I do need to do some calculation and to investigate relevant shipping costs, at least for the US folks. Beside the two progs as well as the CCS owners manual. Spent some time to assemble. Photos of result tomorrow. Came out great & looks better than my original. Awaiting the Math Coprocessor. More to come. Yes ... Not the best photo but you get the idea. Short on time tonight but wanted to post it as promissed. I decided to use some old style Augat gold machine pin sockets to keep it looking retro & add a little color. Quality job on the PCB. Considering Tokabln never held the original board, I'd say very well done! The board dimensions are precisely the same. In Germany we say: "Danke für die Blumen"
wich means, thanks for the compliment... while the correct translation is: "thanks for the flowers"
have you received the missing APU chip already and does your card works ? Just to let you know... RalfK and myself, we received some fake chips from a chinese supplier, so we purchased from another chinese source and these APUs seems to work. At least the "addition" test works fine. So I hope your card is working as expected. I also received some RAM chips and added them to the board but didn't test them yet... because I'm short of time at the moment. One raw PCB costs 5 EURO plus shipping... I'm probably able to offer additional (but not all) parts. Just ask. Yes, I received my missing APU chip that I ordered from eBay auction 283157894520. I installed it, ran your tests, and got expected results. The APU chip I received works fine. I also added the RAM chips to the board but I have not yet test the RAM. Maybe I should I update my photo.(?) The board looks quite nice. Still looking for CCSoft disk. Hopefully this will show up somewhere.